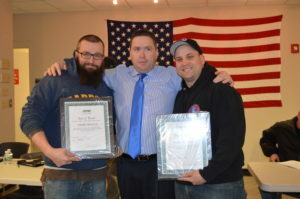 Bob Butler and Dan Hardy present certificates to SMW who stepped up and helped in times of need. Local 17 Sheet Metal Worker Apprentices team up to help a brother. While driving in Dorchester, MA, on January 24, 2017 Local 17 Journeyman Gary Lynch Jr. notices two young children, were in distress on the side of the road. The young girl was in distress and bewildered because her 12 year old brother was unconscious. Gary recognizing the situation trusting his CPR and First Aid training under the Coyne guidelines; first checked to see if the young boy was breathing and he was in fact not breathing. He then checked for a pulse and the next correct assessment he determined there was something blocking his airway. Gary Lynch Jr. then implemented the Heimlich maneuver and resuscitated the young boy. Gary Lynch Jr.’s heroic actions, correct assessment and skills no doubt saved this child’s life. On February 8, 2017 at 7:45 am, there was a welding class in progress when one of the apprentices, Robert Shaulis who was welding heard a thump in the adjacent booth, he then noticed another apprentice on the floor, Robert’s quick and wise assessment was to hit the electrical disconnect; because the apprentice who had collapsed was welding. Mark McKunes and Sean Provenzano assisted Robert making the correct assessments. The apprentice was having a seizure, trusting their training in CPR and First Aid training under the Coyne guidelines. Supporting head, maintaining an airway, then putting him in a recovery position; watching and observing. If needed they were capable and willing to implement C.P.R. On this day there was an unpredicted ice storm which put the city in gridlock. Resulting in a slow response from 911 which delayed their arrival 25-30 minutes. Quick thinking by John Healy, training coordinator pulling the fire alarm. When the first respondents showed up and everything was under control; they acknowledged that all actions taken were the correct ones. All of these apprentices received their training at Local 17 and follow the guidelines of Coyne First Aid Inc.
Caitlyn Pike, apprentice for Quality Air Metals, working on the job-site at Millennium at Downtown Crossing, Boston. The victim, a union insulator fell off the ladder and was seriously injured. Caitlyn recognizing the situation, used her training as a former E.M.T. 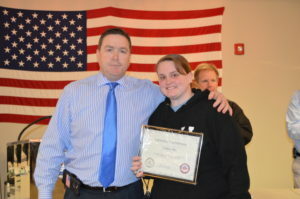 along with the training she received at Local 17 in C.P.R. and First Aid. Making the correct assessment for breathing used a method which is called STERNAL RUB, which resulted in restoring normal breathing. Also realizing the possibility for internal or spinal cord injury it’s important to limit any body movement. The job safety officer arrived and took over the situation. Caitlyn’s quick thinking and intervention, in all probability was a huge factor in saving this man’s life. We are proud of these men and woman for stepping forward to help another member and honored to call them our Union Brothers & Sisters.